Made in Missouri, these fun folding cards conceal bars of delectable caramel-filled chocolate. When lifelong sweetie Stacy Stahl found herself in a gifting pickle, she launched into problem-solving mode. What do you give someone when a card isn't enough, but a big gift's just... too much? Stacy's solution: A message with a hidden treat. Each of her fun folding designs conceals a delectable dark chocolate bar filled with rich, creamy sea salt caramel (and made using fair trade ingredients). 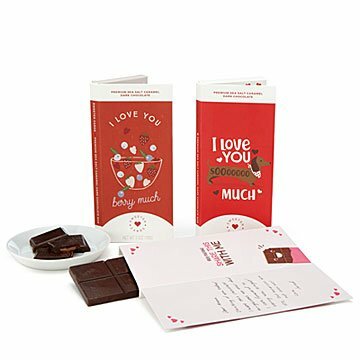 There's space inside for you to draft your own note, too, which means even more for your sweetheart to savor. Made in Missouri. Friends, family, and acquaintances agree: Celebrating others has always been part of Stacy Stahl’s personality. That’s exactly why she started creating cards with scrumptious treats hidden inside. Stumped as to what to get in situations when cards weren’t enough, but gifts were too much, Stacy decided to create a solution of her own. The result? Delicious chocolate tucked inside a sweet design that says more than just “thinking of you.” If you still need evidence of Stacy’s thoughtfulness, consider her previous project, a website chronicling real couples’ proposal stories. Contains milk and soy. Products have been manufactured on shared equipment that also processes peanuts, tree nuts, eggs, soy, dairy and wheat products.